I wonder if the audience is still there? 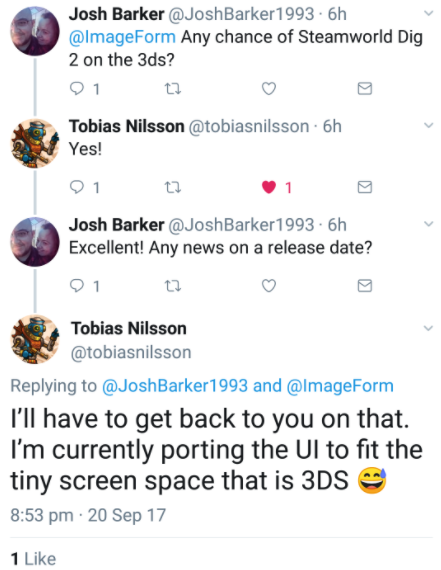 It would be an incredible port for sure. Chicken Wiggle bomba probably say no, but good luck either way. that's a bad example that got way blown out of proportion. Since its not pixel art the compressed assets dont look great on 3DS. 3DS is the only system where you can play the whole series starting from DSi Ware. It obv. wont sell as much as the Switch version down the line but it should be worth the port just as a goodbye present to the plattform and people wo still play on 3DS. Def. wouldn't be a Chicken Diggle situation... or whatever the latest Mutant Mudds dev game was called... lol. If the port isn't costly, I imagine it will be well worth it for Image and Form. The 3ds is where lots of people played Dig and Heist and it's still a platform where a lot of kids play. They'd have to make the text boxes a heck of a lot bigger because I'm struggling to read them even on the Switch screen. But having the map displayed on the bottom screen on 3DS would be a nice benefit at least. I think the 3DS version at least is a "thank you" from Image & Form to the 3DS community. Before Dig 1 released (it was 3DS exclusive at first), Image & Form was close to going bankrupt. The big success then saved the company. Dig 2 in 3D would be amazing. Yes, it was already planned for 3DS and Vita, but 3DS hadn't hadn't gotten a date. I'm sure it would get prominent Eshop billing.....unlike Chicken Wiggle. To be fair, Chicken Wiggle did get prominent eShop placement on the European eShop. Though Europe has always historically seemed to be a weaker region for 3DS downloads as unit sales, at least for Jools' games - I suspect that's down to the 2DS's popularity versus other regions. What a shame Nintendo doesn't support crossbuy between Switch and 3DS like Sony does between Vita and PS4.